As shoppers around the nation crowded stores and malls in the wee hours Friday to grab discounts and hard-to-find items, early reports pointed to some renewed spending vigor. The nation's retailers ushered in the traditional start of the holiday shopping season with expanded hours and deep discounts on everything from toys to TVs in hopes of getting consumers, many of whom have slashed spending to focus on basics amid high unemployment and tight credit, to open their wallets. Online sellers including Walmart.com and Amazon.com also pushed to grab a piece of the action, pushing deals on Thursday and even earlier in the week. Several large retailers, including Walmart and many Old Navy locations, opened on Thanksgiving, hoping to make the most of the extra hours. Retailers are banking on this crucial period to bolster their bottom line in a tough economy. "This is game time. If you're in retail, there are some butterflies. There is some caution. It's been a very difficult year," Brian Cornell of Sam's Club told CBS News correspondent Don Teague. The National Retail Federation estimates the average consumer will spend $682 this year - slightly less than last year's $704 average, Teague reports. Early reports from Best Buy and mall operator Taubman Centers offered some encouraging signs that consumers were buying more for themselves and that crowds were larger compared with last year. Toys R Us CEO Gerald Storch said that on average about 1,000 were in line for the midnight opening for each store. "So far, we are seeing that consumer are willing to spend a little more than what was on their intended list," said Marshal Cohen, chief retail industry analyst at NPD Group Inc. "This is a big gift for retailers. It was missing from the equation last year." 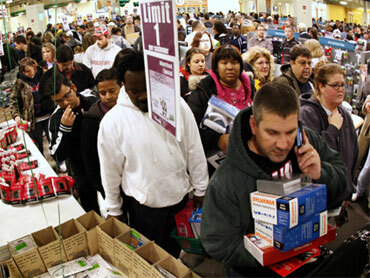 Still, worries about jobs clearly were on shoppers' minds as they lined up for big bargains on TVs and practical gifts. At a Best Buy in suburban Cincinnati, store officials said some people starting camping out with tents at 5:30 p.m. Wednesday. The store started handing out tickets for big items, like laptop computers and televisions, around 4 a.m. Friday. Robin Fryman, 47, of Mount Orab, Ohio, said she and her daughter, a friend and her husband got out at 6:30 a.m. for deals at Best Buy. Her hours as a food worker were recently cut from 40 to 25 per week. "I've definitely cut down. You have to cut down, because you have to eat," Fryman said. She said she usually shops on Black Friday, but got out earlier this year to find a camera for her daughter. They bought a $300 Nikon camera for $172. Other than that, she's focusing mostly on practical items like clothing. Dondrae May, a manager at Best Buy's Framingham, Mass., store, said shoppers started lining up at 4 p.m. Thursday for the 5 a.m. opening for such specials as the $299 32-inch Dynex flat-panel TV. Crowds were larger than last year, he said, and shoppers were filling their baskets with more items than a year ago, when they were shellshocked after the financial meltdown. The biggest draws were laptops, TVs and GPS systems, he said. "A year ago, they were focused on what they needed," he said. At a Walmart in suburban Marietta, Ga., early morning specials on flat-panel TVs, cameras and other electronics were sold out before 7 a.m., two hours after the store started selling the early morning specials. Aside from electronics, store clerks said $2 bath towels, kitchen items and children's toys also were selling well. Most of the Walmart stores were open on Thanksgiving to prevent the mad dash for the 5 a.m. opening in the aftermath of the death of a Walmart worker on Black Friday in a Long Island store. Still, with unemployment at 10.2 percent, many analysts expect that total holiday sales will be at best about even from a year ago. Optimism rose in early fall as shoppers spent a little more, but stores say they've seen a sales slowdown since Halloween, putting merchants more on edge. The holiday weekend has high stakes for retailers who've suffered through a year of sales declines. It's also important for the broader economy, which could use a kickstart from consumer spending. Black Friday gets its name because it traditionally was the day when huge crowds would push stores into "the black," or profitability. But the weekend doesn't necessarily predict spending for the rest of the season, which accounts for as much as 40 percent of annual sales and profits for many stores. Still, retailers closely study buying patterns for the Thanksgiving weekend to gauge shoppers' mindset - what kinds of items they're buying and what deals are luring them.